Hello From Long Lane Honey Bee Farms. We're David & Sheri Burns, working hard to encourage more and more people to become beekeepers! It's been very busy around our bee farm the last few weeks. In addition to keeping up with the hive woodenware demand, we are working hard to make sure all the packages get delivered on time. And last weekend was a huge success. Beekeeper after beekeeper kept driving in and picking up packages and equipment, anxiously anticipating getting started keeping bees. I was totally exhausted from my trip down to the Orlando Florida area, but it energized me to meet so many new beekeepers. It was a pleasure to spend 4 packed days with Larry. Larry is a Renaissance man. He has a broad intellectual interest in art, music, and has many other interests such as Persian rugs. But bees are his business and he knows the business of beekeeping. Larry is well liked and respected throughout his community in Florida and Wisconsin. He's a true gentleman and has supplied our local bee club with packages year after year. Here's a video I took on my cell phone of us working 400 hives, shaking bees for our customers outside of Orlando. The weather was perfect and we found the bees to be very populous and healthy here in this common orange grove. Huge swarms would often collect on the Orange trees. 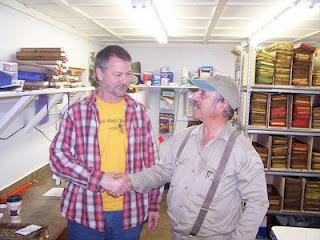 I also met another well known beekeeper in Florida, David Miksa. David has been a queen breeder forever. Miksa is on the right. We visited his operation to purchase queens for the packages. He had the queens all ready when we arrived. David's queens are well sought out by the beekeeping community. The European Discovery channel did a documentary of David's operation a few years ago. David has a excellent grasp of beekeeping and raising queens. Here's a few pictures we took while visiting David Miska. 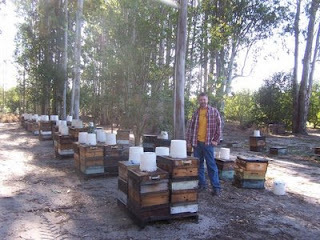 David's hives are nestled under those tall, Florida Eucalyptus trees. David's family works along side of him and they have an efficient operation in a beautiful setting. It was nice being in Florida, soaking up all the nice, warm weather! But, the day finally came when we had to load up all the packages and head north, back to our honey bee farm, knowing that customers would be waiting to receive the packages. So, we loaded them up and headed north, north through half of Florida, all the way through Georgia, Tennessee, Kentucky and finally into Illinois. It's a long trip. And with bees as precious cargo, stops were kept to a minimal for the 20 hour drive. Larry, Henry and myself drove the truck back, each taking turns so others could get some rest. Once we arrived home with all the packages, customers began arriving to pick them up. 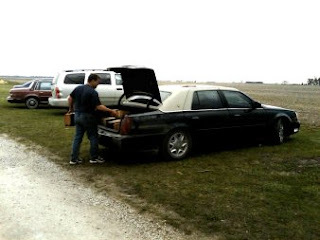 Most brought pickup trucks, a few brought cars, but the best one was Charlie, a good customer of ours, who put 20 packages in the trunk of his Cadillac! Charlie is expanding his hives from last year, so he's an old pro. But many customers who picked up packages were new to beekeeping and picking up their package was very exciting for them. Most seemed overwhelmed at even seeing a package for the first time. We are now making splits and nucs. The weather appears to have broken for us. In fact, many beekeepers are reporting hives that are already swarming, so it is important to split hives to help cut down on the swarming tendency. It may not prevent all swarming, but some. To make a split, it is best to pull out 3-5 frames from the strong hive. These frames should be of brood in various stages with bees on the frames. Find the queen and keep her in the main hive and place a mated, new queen in the split. 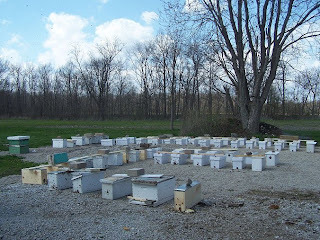 It is helpful to place the split a few miles away so that the foragers don't return to the old hive. Or you can swap locations of the new split with the old hive which floods the new smaller split with foragers. We often make splits without worrying about moving them 3 miles away. Usually, the split has bees that are about to become foragers anyway so the force is not reduced that much for too long. Before we started raising queens, we would let the split or the old hive raise a queen, which ever one didn't have one. But now, we realize that we can save a few weeks of waiting for the queen to lay by placing a laying queen in the split. Some have asked us what to do if the weather is poor when a package needs installed. It is important to install the package as soon as possible. Most packages can last 5-6 days with the can of food inside, but who can be sure. So I would recommend installing the package the same day you receive it. BUT WHAT IF IT IS RAINING? If it is raining, install your package under a porch or overhang. Do not let your queen get wet from the rain. The bees really should not be rained on. Once installed, you can cover it and carry it to it's location. I installed packages last week in the cold rain, hail and lightning. So cowboy up and get-er done. What we want is to get the queen released as soon as possible. She is taken care of in the cage, but not as well as if she was out and about. If you want to take a chance and wait a day or two for better weather, keep your bees in a dark place around 50-60 degrees and spray them with 1:1 sugar water lightly a couple of times a day. Be careful not to spray the queen cage if she is visible. If it is going to be below freezing after you install your package you should worry...I do. Namely because I have lost packages to those sudden cold snaps at night. If you only have a few, and you have a strong back, seal them off and move them into a garage or area that will stay between 35-50 degrees. Then, take them back in the morning when the temperature rises above 37. Be careful in trying to put a heat pad or lamp around the hive. You can easily overheat them or burn your hive and house down. Be careful! That's why we never like to ship packages until the very end or first week of May. Also, those of you calling in for questions, please be patient because this is the time of the year when we work away from the phone most of the day. Leave a short message and we'll get back to you in 48 hours. Thanks for understanding. That's all for now. Enjoy your bees. Until next time, BEE-have yourself. bees and queens will come from. I really enjoyed the video.